The second entry in our five-part series aimed at extending the life of your mattress deals with the benefit of covers – not for keeping you warm, but for keeping your mattress in tip-top shape! You may read the title of this tip and ask yourself, “Who in the world would buy a mattress and then sleep on it bare, let alone even consider doing that?” Hopefully, the answer is nobody, but in addition to sheets and blankets, there are a couple other types of covers that can benefit your mattress just as much as they can benefit you. 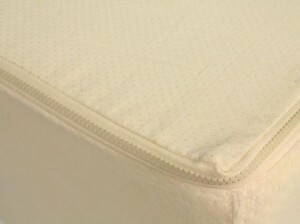 The more commonly used of these two kinds of covers is a simple fabric mattress pad or mattress cover. These come in a plethora of styles, materials and varieties, ranging from a basic cotton pad with an elastic band to keep it secure, to padded covers that zip snugly in place. And even if they aren’t purchased for their comfort qualities, these pads serve as an extra layer of protection between your body and your mattress. Usually made of soft, absorbent materials, these pads can guard against stains and damage from spills and body moisture. And being removable, these fabric pads can be washed regularly, keeping your bed fresh and clean. This is important beyond hygiene reasons, because in most cases, a stain on a mattress will void its warranty, even if the stain is superficial and the defect is structural. The other, less-frequently used kind of mattress cover is a waterproof, hypoallergenic cover. These are frequently made of vinyl or similar materials and are usually associated with being the covers purchased for very young children to protect a mattress against accidents. However, this mattress cover is beneficial for mattresses and people of any age. The first reason is that it provides a barrier against moisture, from the amount our bodies generate during the night, to a glass of water, spilled on the bed. The other benefit, depending on the particular material used, is that they can help combat allergies. When constructed of tightly woven, non-permeable materials with strong seams and zippers, these covers can prevent dust mites from accessing your mattress. It will keep out any other potential irritants a mattress may collect over years of use, further benefiting allergy sufferers. And with the construction of mattresses, once mites, dust or other irritants have gained access, there’s not much you can do to get them out again. Some individuals find these covers to make for a slightly warmer sleep than a bed without one, but in most cases, adding a combination of sheets and a fabric mattress pad can negate or reduce any temperature issues. In addition to being more durable, the thicker this kind of pad is, the quieter it is to sleep on as well. As of late, more and more pads are being created that blend the hypoallergenic and water resistant qualities of a vinyl cover with the comfort and softness of a cotton one. Regularly cleaning these pads as well as the rest of your bedding is important as well, but it’s a fair trade-off to wash a few sheets compared to having to get an entire mattress professionally cleaned. Either way, these covers shouldn’t be viewed as something we outgrow as we age. The benefits they provide as a child are just as helpful to us as adults in different ways. These pads help protect both your health as well as the mattress, making them quite valuable. Whether your goal is to just keep your mattress fresh, increase its comfort, or fight allergy troubles, the right mattress pad can help with all of these things.